We had decided to run this 5.05-mile race a while back, well before I struggled through the Fifth Third River Bank Run 25K. Regardless of how the River Bank Run went, I wasn’t going to miss this race. We ran it in 2011 and had a blast that day despite the rain and generally blah conditions. 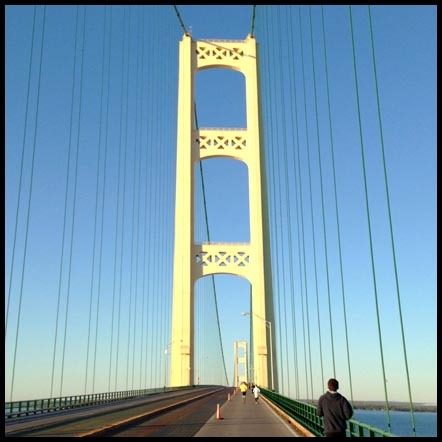 It’s a very unique opportunity to run the Mackinac Bridge, and one of only a few times during the year that runners (or walkers) are allowed on the bridge. The race is held on the Saturday immediately before Memorial Day, so the long weekend is an even better excuse to head up there, run the race, and enjoy the beauty of northern Michigan. We headed up to Mackinaw City the day before the race (yes, the name of the city is spelled differently than the names of the bridge and island). The packet pick up/race headquarters is in the Mackinaw City Recreation Center; this location has plenty of space for the packet pick up as there isn’t an expo for this race. Mackinaw City, where the race finishes, is on the south end of the approximately five-mile-long bridge. It’s also where the runners catch a bus to the starting line in St. Ignace on the north end of the bridge. Packet pick up was well organized, and it was a quick and easy process. The race packet included the bib, race shirt (a nice dark blue cotton t-shirt), a drawstring backpack, and a few other miscellaneous items. We headed out for some dinner – pasties turned out to be a pretty good night-before-a-race meal – then walked over near the Mackinac Bridge for a few minutes before heading back to our hotel room to rest. We kept our time by the bridge short because there were a LOT of disgusting gnats or similar flying bugs swarming all over everything near the water. We weren’t looking forward to dealing with that when we ran the next morning. Race day alarms always seem to go off early, and this one was no exception. We were staying less than a mile from the race headquarters, and it worked out well for us to get in a warm up jog and avoid driving and parking. An added bonus is that it gave us a few extra minutes of sleep. The race had a rolling start, with buses leaving regularly from about 5:30 a.m. to 7:00 a.m. to drop runners off at the starting area. The starting area for this race is pretty unique among races I’ve run, as it has a standalone timing mat that you can cross whenever you want once you arrive at the starting area. The race starts in a park that has a small building with bathrooms, and there are also bathrooms available at the race headquarters before boarding the buses. I always appreciate having enough bathrooms available before a race, and it’s even better when there are actual bathrooms instead of just porta potties. We didn’t have to wait long for a bus to the starting area, and the trip to the north side of the bridge was quick and uneventful. The bridge, which is part of the I-75 freeway, has two lanes in each direction. To minimize traffic disruptions, runners get the outside southbound lane; the other three lanes are open to traffic like normal (the race has no impact on northbound traffic). We wanted to start the race on the earlier side, and we didn’t see any lanes blocked off or any runners as we were being bussed across the bridge, so we were wondering what was going on. But as we approached the end of the bridge, we saw crews blocking off the running lane just ahead of the first runners. They don’t mess around with unnecessarily blocking off lanes hours before the race! Fortunately for us, there wasn’t much traffic on the bridge that early in the morning anyway. When we got to the starting area, I took a few pictures then used the bathroom. I can’t emphasize enough how nice it is to have a rolling start with real bathrooms on the premises. The weather was great for running…a little on the cool side, but clear and not very windy. I didn’t have a specific pace or goal time in mind. The race is 5.05 miles even though the race website claims it’s 5.6 miles. The trickiest part of this race for me is that most of the first half is up a steady incline. It’s not as bad as it looks though, and I approached it the same way I did when I ran it a couple years ago. Just try to attack the hill with a steady effort and avoid running too fast or too slow. Once I got started, I felt pretty comfortable. As I expected, the second mile (the only mile that is completely uphill) was my slowest. My wife and I ran together until about the four-mile mark. We improved our pace after the second mile, and I was able to pick it up a little over the last mile or so. One thing I didn’t think about while running, but realized after the race, is that I didn’t notice any of those annoying flying bugs during the run. I have no idea why there were so many of them around the bridge the night before the race, but none during the race. Whatever the reason, I’m not complaining. The finish line is about a half mile off the bridge in Mackinaw City. After exiting the bridge following the downhill portion, I was able to maintain my pace as the route wound along a few Mackinaw City streets. I didn’t have quite as much of a kick as I would like at the end of a race of this distance, but I won’t complain at all considering I haven’t done much speed work this year. One of the many unique things about this race is that the rolling start makes it very difficult to know how you’ve placed until everyone has finished and the results are posted. Another unique thing is that I didn’t get passed by anybody who started after me, yet I didn’t qualify for an award in my age group (the top three in each age group got awards). How many times have you not been passed in a race, yet only finished fifth in your age group?! I didn’t take home an age group award, but my wife did as she won her age group and was the second female overall! One of our favorite non-running aspects of this race when we participated in 2011 was the hot breakfast provided after the race. There’s plenty of food, and it’s buffet style so you can grab whatever you want and as much as you want. After we ate, we had a while to wait for the award ceremony. Once my wife received her award, we did a cool down jog back to our hotel. A very pleasant surprise during this race was virtually no hamstring pain. Fingers crossed that the nagging pain in now behind me! If so, I’ll have to credit finally going to see a chiropractor after many years of lower back pain and who knows what other problems stemming from the “jammed up” spot in my lower back. I started to notice a difference shortly after I started treatment in early May, with greatly reduced hamstring pain. So far, so good as the majority of my runs are pain free now (knock on wood). This photo doesn’t begin to do justice to the hot breakfast buffet, but I was too hungry to take many photos. I’m pretty happy with how I ran considering it’s only my second race this year and my first short race of the year. I’m still not close to the shape I was in when I was setting PRs in 2011, but I’m finally running almost completely pain free and ran a big negative split in this race. It didn’t hurt to have most of the second half of the course be on a decline, haha. I’m not sure yet what my next shorter race will be, but I’m looking forward to running at least a couple of 5Ks and/or 10Ks this summer. I highly recommend this race; it’s a great opportunity to run a very unique and picturesque course. We didn’t run it last year because we ran Bayshore In Traverse City, but it will definitely be in our rotation for the future. This entry was posted in Injuries, Racing, Reviews, Running. Bookmark the permalink. If you’re still following this, will you give me an idea of how many total people ran the Mackinac Bridge Memorial run? In 2013, 716 people ran it.